An untested vaccine for 'Rabies' was successfully used on a 9 year old boy after he was mauled by a rabid dog. Louis Pasteur is remembered for his remarkable breakthroughs in the causes and preventions of diseases, and his discoveries have saved countless lives ever since. Pasteur was to prove that airborne microbes were the cause of disease. Pasteur built on the work of Edward Jenner and helped to develop more vaccines. Louis Pasteur was born on 27 December 1822 in Dole in the Jura region of France. 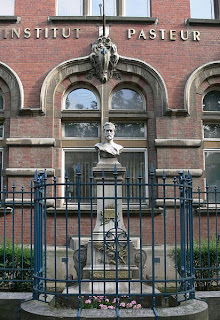 After several years research and teaching in Dijon and Strasbourg, in 1854, Pasteur was appointed professor of chemistry. He was able to demonstrate that organisms such as bacteria were responsible for souring wine and beer (he later extended his studies to prove that milk was the same), and that the bacteria could be removed by boiling and then cooling the liquid. This process is now called pasteurisation. Pasteur then undertook experiments to find where these bacteria came from, and was able to prove that they were introduced from the environment. This was disputed by scientists who believed they could spontaneously generate. He was asked to help the silk industry in southern France, where there was an epidemic amongst the silkworms. With no experience of the subject, Pasteur identified parasitic infections as the cause and advocated that only disease-free eggs should be selected. The silk industry was saved. 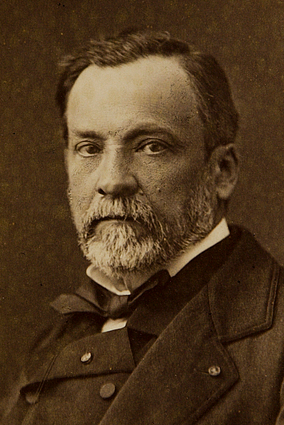 Pasteur's various investigations convinced him of the rightness of the germ theory of disease, which holds that germs attack the body from outside. Many felt that such tiny organisms as germs could not possibly kill larger ones such as humans. Pasteur now extended this theory to explain the causes of many diseases - including anthrax, cholera, TB and smallpox - and their prevention by vaccination. He is best known for his work on the development of vaccines for rabies on the 6th of July, 1885. In 1885, a young boy, Joseph Meister (9), had been bitten by a rabid dog, and was brought to Pasteur. The boy almost certainly would have died an agonising death if nothing was done so Pasteur took the risk on using his untested vaccine.The boy survived and Pasteur knew that he had found a vaccine for rabies. Three months later, when he examined Meister again, Pasteur reported that the boy was in good health. Ironically, though Pasteur and his team now knew that the vaccine worked, no one then in the world of science knew how it worked! In 1888, a special institute was founded in Paris for the treatment of diseases. It became known as the Institut Pasteur. Pasteur was its director until his death on 28 September 1895. He was a national hero and was given a state funeral. Note: Louis met and courted Marie Laurent, daughter of the university's rector, in 1849. They were married on May 29, 1849, and together had five children, only two of whom survived to adulthood; the other three died of typhoid. These personal tragedies were his motivations for curing infectious diseases.